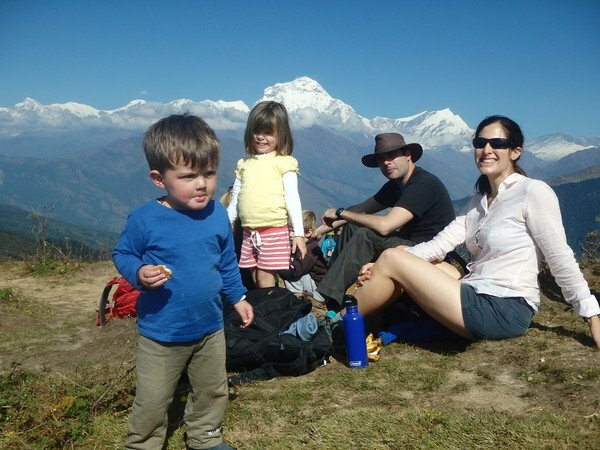 Family Trekking & Hiking Holidays with Children are becoming ever more popular here in Nepal. We recommend Nepal Family Holiday as the tour and destination for your Holidays with Children. It's an excellent option for spending quality time with your loved ones, and we can help you enjoy a well-organized Family Trekking in Nepal with your children. On our Family Walking Holidays programs, we provide porters, horses, dokos (Nepali basket) and child carriers, as well as all the other logistics necessary for your Trekking in Nepal with kids. On a private tour, you and your family can enjoy the possibilities of seeing remote villages and regions that might not be accessible otherwise. This type of Family Trekking adventure carries the great potential for learning and discovery and is wonderful for family bonding. Not to mention there is also the friendliness and warmth of the Nepalese people, which always has a smile for you and your children. There are many program options available. You may choose to hike along a route in a mountainous region camping out at night or staying in lodges. On these programs, you will be guided and your luggage is carried by porters. If you decide on a base location your luggage will stay at the resort and you and your family will be introduced every day to different routes. All you’ll need is just a daypack. We can help you craft your own private tour and we can provide you with many suggestions. Areas we provide services include Everest Region, Annapurna Region and Langtang and Helambu Region. Since we have done all the Family Trek in Nepal with our own children, we can provide you all the information and suggestions you need. Let us assist you in making unforgettable memories. 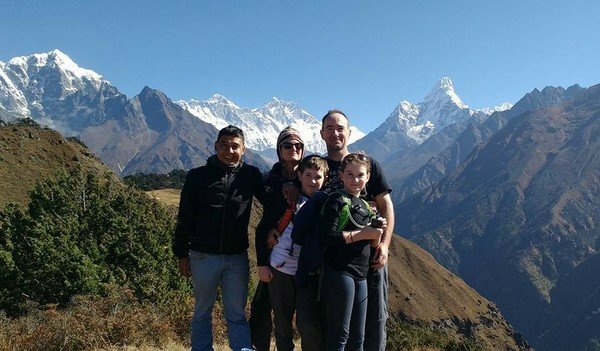 Nepal Family Trip is an adventure with kids and can be amazingly interesting beyond your expectation. Nepal is a destination completely worth 'holidaying' in with your children. Here traveling with children promises a fascinating trip of a lifetime. There are numerous thrilling outdoor activities to enjoy like; Tibetan horse riding, cultural/handicraft tours, village tours, Jungle Safaris, easy grade Hill station treks and much, much more. Nevertheless, especially for trekking enthusiasts, proper preparation beforehand and a wide selection of your trekking route is a must. Our recommendations can aid you in the success of your adventure with your family. Some higher grade trekking trips are not advised for children below 12 years. Normally, traveling with small children is not advisable at the higher elevation above 4500 meters (see options under the section Family Trekking & Hiking Holidays with Children). But, especially for the younger children, we have crafted some wonderful trips. These packages provide a relatively short trip and avoid extreme elevations. We encourage you to set your own pace while trekking to accommodate everyone in the group. We assist you and your family in the acclimatization process and provide proper guidance in ascending in elevation. Some of the ways we assist in acclimatization is helping you stay well hydrated and providing nutritious meals. Our team is always there with support, encouragement and happy to take your pack when necessary. One of our company’s favorite programs is riding on Tibetan horses in the Everest, Annapurna and Langtang region. Click for further information to choose the most suitable Treks/Tour for your family. Your kids will love it! • It is not a suitable to take very young children on a high-altitude trek, because they may experience difficulties with acclimatization. We recommend up to 3000m is ok.
• It is possible to take young children (1 year plus) on a walking or trekking holiday. We will provide any form of transport such as small horses, dokos (Nepali basket), porters and child carriers. • For very young children of 0 - 12 months in child carriers, it is probably best to be based at a single location. That way, everything will be ready for you on your return at the end of the day. • Young children, however, can come along on low altitude treks. Short walking tours or day walks are also a good option for young children. Remember that you will need to make regular stops and your progress will be a lot slower than walking without children. • Older children of 7 years or more who are active and acclimatize well can make great trekking partners — but don’t get too upset when you realize that they are faster than you. • The most difficult age to take children walking is probably from 5 to 7 years as they are too old to be carried and too young to walk long distances. In this case, it depends upon the child and the parents know them the best to decide what kind of holiday to book. • Babies who can support their own heads (around 6 months) can travel in a back carrier, which can usually take a child of up to 4 years (we can provide). • There are numerous child carriers available with features such as stands to support the rucksack when loading and unloading and accessories such as sunshades and rain covers. • First, decide your destination and tour package. We will assist you in tour package selection and level of guiding appropriate for your tour. • Take extra snacks. Bring your favorite cookies and candies. Enjoy some dried fruits and nuts also. At higher elevations these keep your energy up and simple cookies can mitigate some effects from altitude. • Take plenty of water with you. That means adequate water bottles and hydration options. Young children get dehydrated very quickly in warm weather. • Ensure that the whole family is well equipped. If the children get blistered feet from poor fitting boots, then they will make sure that this is your last family walking holiday! • With younger children in child carriers, make sure that they are protected from the sun with a sunhat and lotion. On cooler days, the wind can chill them very quickly so use layers of clothing with a wind resistant top layer. Make sure that you take regular breaks. • Walk together as a close group. Always walk at the pace of the slowest walker. • Plan to make regular stops. Along the way are fantastic views, and excellent photo opportunities. These breaks can allow children time to do mini-exploration. • Bring playing cards and colorful pens & paper with you for the afternoons and/or evenings at the lodges. • Don't forget your kids’ favorite cuddly toys for the nights!